Uncle Drew continues his sneaker legacy with the Swoosh as they prepare to launch his fourth signature shoe. While the Nike Kyrie 3 has had a strong run of creative colorways and big-game moments, Kyrie looks to move on to the Nike Kyrie 4. The Kyrie 4 made its debut two weeks ago and has been a strong silhouette for the SWOOSH. 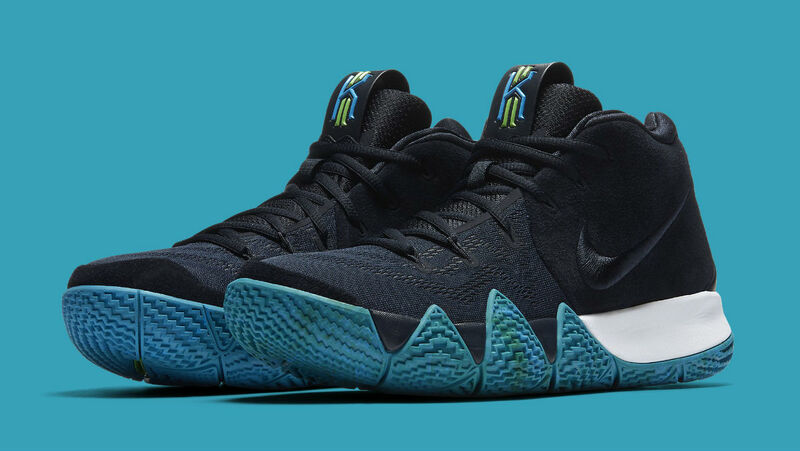 As Kyrie and the Boston Celtics continue to make a push for the Championship, this next Kyrie 4 is dropping in an obsidian and teal color scheme. This Nike Kyrie 4 features a dark obsidian suede upper paired with a matching embroidered Nike Swoosh on the sides. An aqua shade of blue and hits of neon green are seen on the tongues and outsole while sitting atop a white midsole. Make sure you grab your pair of the Nike Kyrie 4 on January 6th at Finishline.com.